Find out about our product. You will find some great features here involving the creating and the technology behind these products. We hope you find some inspiration! The legacy of a loved one should never be forgotten. And now you can keep their memory alive through the Eternal Timekeeper™ Online Memorial system. Using our Patent-Pending technology, we are able to embed a Near Field Communication (NFC) Smart Tag Device inside a Porcelains Unlimited urn or memorial. When a loved one with a smartphone or tablet scans their device within 1" of the urn or memorial featuring the NFC device, it instantly and automatically communicates with the urn or memorial to open their loved-one's custom Profile Page on the Eternal Timekeeper website. From this online custom Profile Page, family and friends are able to upload, view and share stories, photos and videos. This helps younger generations learn about their grandparents, great grandparents, and relatives in a way that fits their connected lifestyle. This page can also be access for any computer or smartphone with internet access. Not to worry, there's no software to install and no batteries to replace, ever. To get started, simply register for a free Eternal Timekeeper account. 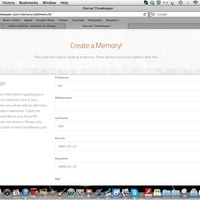 After registering your account you will be prompted to the homepage where you have the option to "Create A Memory". This is the exciting part, fill in all required fields and begin the journey. Next, on the memory panel is your road map for content. By clicking on the different sectional tabs you may upload the content you wish to be provided to be shared. Enter the profile information. Information requested will be Names, Dates, Age, Hometown, State, Pictures and picture cropping Top or Bottom. Add Sensor Technology: By adding the sensor technology, a memorial picture will be linked directly to your online Eternal Timekeeper profile. 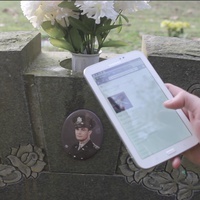 Interaction with the memorial pictures will allow users to use their smartphone or tablet by holding close to the memorial picture. This will direct them through sensor technology to the online memorial site of Eternal Timekeeper's profile. 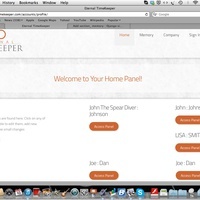 Here is where content can be added and changed to your memorial profile through your Access Panel.